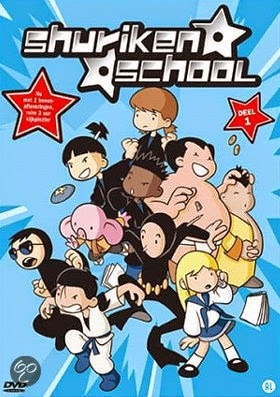 The plot of Shuriken School follows lead protagonists Eizan, Jimmy, and Okuni during the summer holidays. The three friends soon engage in an interesting, albeit dangerous, struggle for reputation, family, and a whole lot more when Eizan's dad is kidnapped by professional ninjas. Upon setting out to find and rescue Eizan's father, the kids must employ the skills and techniques they studied so fervently during their first year of ninja training. Things are difficult however, when they learn that the Jade Shuriken, an ancient symbol of extreme ninja power, threatens Eizan's dreams and potential to become a true ninja. A series of events unravel as Eizan strives to clear his name, realize his dreams and secure his place at Shuriken School.